From doing no exercise to attending multiple Swim for Health sessions a week, Glyn has come a long way in a short time! Glyn, who has Cerebral Palsy and Minor Autism and uses a wheelchair, has seen a remarkable improvement in his mobility and strength as well as a vast improvement in his mental health. He enjoys being able to get out of the house and do something different. 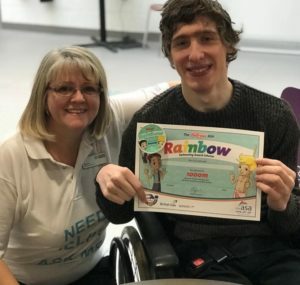 Since finding out about Swim for Health Glynn, aged 25 from Sherwood, has started swimming multiple times a week at different Swim for Health sessions. “I started swimming mid-late summer 2018 after Dad & Rikki realised that there were swim for health sessions that would be great for me. I went from no swimming, to attending one sessions a week, to swimming constantly. Obviously I really enjoy getting my body working. The physical benefits are really important but also for my own well-being. I moan if we’re late for swimming or life gets in the way and we can’t come! The sessions get me out of the house and doing something different. I can now walk in and out the pool rather than using the hoist, which makes transferring out of the car easier. I’m also able to walk aided slightly to and from the car which I wasn’t able to do before. Also since swimming I have started sleeping better which gives me loads more energy! I also have more strength on my upper body and lower body which definitely makes doing things easier. During the session I feel really happy and makes me feel strong knowing that I’m able to do it. I get really stressed if I can’t come, swimming makes me determined to do more! Having support is very important; swimming wouldn’t have been possible without my family to bring me here and support me in the pool. The Poolside Helpers are also really important to me. Without Sharon I would never have reached 1,000m and without Ruth I would have never achieved my 1,500m. I would say the pool helpers are all very considerate and helpful, and super friendly and without them I wouldn’t have achieved what I’ve achieved! To take a look at the Swim for Health Sessions and decide whether it’s for you, click to view the leaflet below.